Welcome. This Site is all about Sharp, Sharp Planes and Sharpening. Experience th e joy of quality tools for sharpening and the results produced. Tips about Sharpening, Tuning and maintenance of sharpening equipment. Please let me know if you have any problems with the shopping cart. Stay Sharp, Jim. Added Oct. 2017 - New Medium Board with Fence and optional Veritas Track - ideal for Box-making: plane all edges exact and trim ends on one Board. Pshhhht—ever heard it? The sound of a finely tuned plane taking off shavings less than a thou. thick. Of all the tools available to woodworkers, Planes and Chisels are probably the only ones that are not ready to go, right out of the box. Even high-ticket brands need honing before they are used, older Planes need more work. Sharpening: Quality Sharpening Products including Water Stones from Suehiro Cerax, Japan and Diamond Plates from DMT, USA. Diamond Plates for rough and medium, Waterstones for medium to fine to a super fine mirror finish. Whetsones from Arkansas, USA - including Bench Stones, Combination Stones, Slips and Pocket Stones. Grades from Soft through Hard, Translucent and Black. Note that Translucent is the Rarest but Black is the Finest. Guides and Jigs: Honing Guides and Jigs from Veritas, Canada. Amazing: I have always been amazed that New Woodworking Planes need work before use. The Blades are unprepared, sometimes they claim to be Lapped but soon prove wrong during the Honing Process. Others are not just Dull but Blunt. I can imagine that there would have been many disillusioned woodworkers over the years who made a purchase, tried it on a board and were disappointe d to find a poor result - and, being brand new, thought that that was as good as it gets and didn't expect it to any better - ever. Woodcraft USA: Distributor for Woodcraft USA in Australia, including WoodRiver Planes and IBC Premium Blades. Many items in stock, mainly related to Planes, Chisels, Sharpening, Saws, Marking & Measuring as well as useful Bench Items. Any other items from the Woodcraft catalog can be imported on request, except some items which may be covered under Dealership Territory Agreements and power tools. Shipments arriving every 4-6 weeks. "Click" to go direct to the Woodcraft products in stock, please call 02 4447 8822 to discuss special orders. Japan Woodworker, Calif., USA was acquired by Woodcraft - Now I am able to access JW products via the Woodcraft Warehouse. Pricing Policy on imported products: Woodcraft, IBC, Japan Woodworker, PEC Tools, Dan's Whetstones - US List converted to AUD (less 3% Bank Fee charged on all international dealings), plus Freight (at my cost) plus Import Duty (if applicable) plus GST. Works out about the same as an individual purchasing direct for the US - usually cheaper. Plus: Added benefit of local backup here within Australia. Maxis Distribution: Distributor for Maxis Distribution (most CarbaTec products), Sharpening products in stock, Veritas Planes, Honing and Grinding Guides in stock - all others stocked on request. Grobet Taper Saw files are triangular, single cut file designed for filing a variety of saws with 60 degr ee angled teeth. Tapered toward a point, this file has cut edges for filing gullets between saw teeth. Taper saw files are available in a number of widths: regular, slim, extra slim and double extra slim. Single cut on all three sides. 3/16" wide or slimmer. JD Handmade File Handles with Solid Brass Ferrules in 4 sizes, Brass Ferrules available separately. Japanese Waterstones: Suehiro Cerax - Ceramic Waterstones from 1,000 - 8,000#. Single, Double (1,000/6,000#), Stone on Base, Nagura Cleaning Stone. G15 Rust Preventative from Australian Inhibitor - outperforms any other Rust Preventative that I have tried. This product is in an aerosol can and cannot be mailed so only available via personal sale at Trade Shows and Workshops. Quantity Discount available. Sales: Visit the eShop-sales Pages to purchase online via secure PayPal system (no need to be a Paypal member). Orders can also be placed by phone, fax or email - see "Contact" for details. Bench Planes in sizes #1, #3, #4, #5, #6 & #7 - Bedrock-style construction, heavy castings, precision machining, heavy 3mm A-2 Irons, heavy Cap Irons - Premium Planes at affordable prices. WoodRiver Block Planes: Styled after the Stanley #19 regular angle and #65 low angle, with Knuckle-joint Lever Caps. 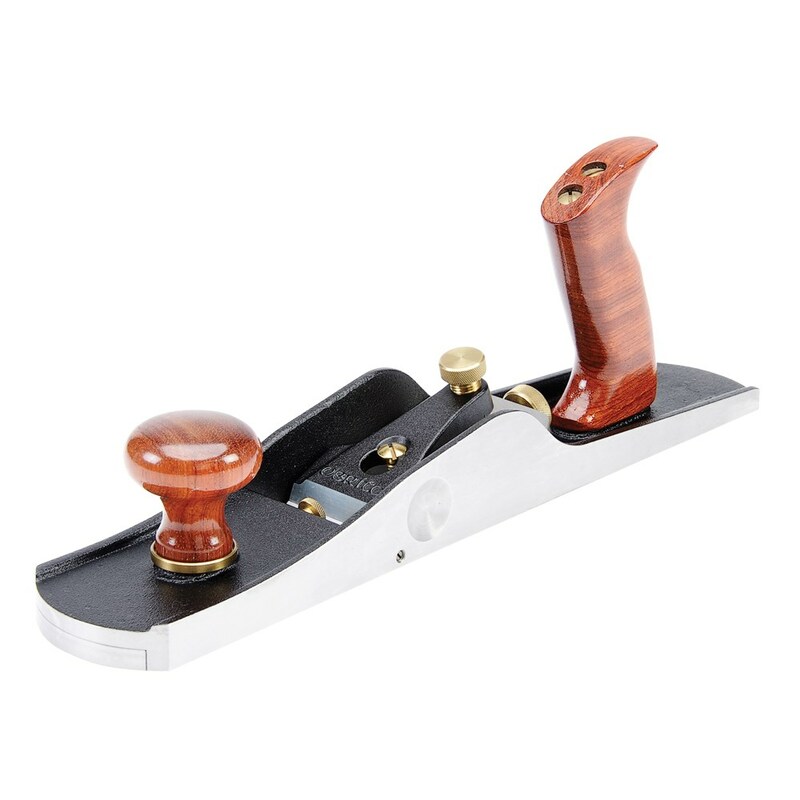 Thick 1/8" / 3.175mm A-2 Irons, precise machining and good "feel" - these may be the best value Block Plane on the market today. New, Genuine Stanley Screws in those hard-to-find Stanley threads. NOTE: Only a few New Screws left but many Secondhand - please Call for info. Also the latest Metric threads. Workshops: Sharpening and Plane Fettling workshops - see "Events-Diary" or "About Us" for details. Events/Sales: Several times per year - see "Events-Diary" or "About Us" for details.